If you’ve been to the Photoshop World Conference, you probably recognize Adobe VP Winston Hendrickson from the many times he’s delivered Adobe’s opening keynote presentation to kick off the conference. That’s Winston above during the keynote in 2013, but even if you didn’t recognize him, you’ve felt his input, his influence, and his vision every time you launched Photoshop or Lightroom. Winston was Adobe’s Vice President of Engineering for Photoshop and Lightroom, and he was the perfect person to be in that role because he used and loved those programs as much as we do. He was a brilliant sports photographer — a far better one than I’ll ever be — and he used Lightroom and Photoshop every day for his photography work. He was a true champion of the end user because he actually was an end user. He “got” us in a way I’ll bet few execs in America today could ever do. Winston between plays in Tampa for the Falcons/Bucs game. He would fight for the new features, and improvements and speed boosts — the same ones we all wanted, and his drive, and his team, have made so many of those requests a reality over the years. I loved that when we sat down and talked about things that needed to be added or addressed or fixed in Photoshop or Lightroom, he didn’t defend them; he didn’t excuse them — instead he set out to fix them or to add them, and he had the power and will to do it, and the team that could make it happen. He was the kind of guy you wanted behind such important products, and him being in that role really made a difference. I was heartbroken to learn this weekend that after waging such a brave battle against an incredibly tough form of cancer, he passed away. He faced that fight with an attitude, strength, courage, and sense of humor throughout that was truly inspiring to everyone around him. His passing caught us all by surprise because his on-going coverage and witty writing style (on his CaringBridge blog) made you feel certain that any day this would be behind him, and he’d be back on the sidelines at a Falcons game, or up on stage at a Photoshop World. My heart sank when I read the news. One of my heroes at Adobe, and one of my dear friends and sidelines buddy was gone. He’s younger than me and gone far, far too soon. I could tell you so many stories about what an awesome person Winston was. How he stayed up crazy late on the phone giving me advice when I really needed it, or how we’d talk for hours about football gear and settings and lenses (and how I tried to tell him how much he’d regret hand-holding a 200-400mm for an entire NFL game). I could tell you great stories about how he genuinely looked out for Adobe customers, how he even looked out for friends and colleagues, and how much he loved his wife and family, and how proud he was of his daughter’s softball skills and how much he loved traveling with her team. Anyone who knew him could tell you how humble, funny, laid back, and down to earth, he was. He could make anybody feel comfortable around him, and if you met him for five minutes, you felt like you had known him forever. No pretense. Not an ounce of “bragging” in him. When you were with him, you lost all sense that you were with one of the top minds in our industry. He was just “one of the guys,” and I loved that about him. I could fill pages with stories about him, and our times together, but instead, as a tribute to Winston, I’d like to share a very special story. It’s about what Winston told me was one of the greatest days of his life, and I was blessed to be a small part of it, and watch it all unfold. A few years back, at a Photoshop World Conference in Atlanta, some friends of mine from the Atlanta Falcons NFL team were at the conference, and I had told them what a lights-out sport shooter Winston was (thanks to his many years of shooting his daughter’s college softball team. His timing and technique were pro level). Well, I got the opportunity to introduce them at the conference, and my friend Michael Benford (Creative Director of the Falcons, seen next to Winston in the shot above) invited Winston to come shoot a Falcons NFL game on the sidelines. Well, he was thrilled at the opportunity, and he also made the most of it — shooting like a pro and garnering an open invitation to shoot for the Falcons any time, and sure enough, he wound up covering a number of games for them, in Atlanta and on the road, too. When we’d be shooting a Falcons game together, in-between plays we’d talk about big picture Photoshop and Lightroom stuff, and I was always bending his ear about feature requests, or things our members would like to see added under the hood, and we’d wind up just talking about everything from cameras to cars, too. We laughed a lot, shot a lot of pictures, but when he shared his Picks after the shoot, I was always amazed at his timing and how many “keepers” he got during the game. He nailed a lot of shots I totally missed. Winston was really talented, and he could have been shooting on assignment for any sports wire service, newspaper, or magazine. He was that good. One night over dinner, this Californian revealed something I never knew — he had been a lifelong Dolphins fan. I think saying “fan” is underplaying it a bit. He was a raging Dolphins fanatic! Despite not being from Miami, or even Florida, the Dolphins were the team he grew up following and loving, and he knew every player, every stat, and every piece of trivia from the Dolphins famous 1972 miracle undefeated season. Well, as luck would have it, my buddy Rob Foldy shoots for the Dolphins, and he had invited me to come down sometime and shoot a game with the Dolphins photo crew (Surf, Jon, Brandon, and Jeff). After dinner I called Rob and asked if there was any way that Winston could join me for that sideline shoot. After a few calls, Rob got it approved (Rob already knew Winston from meeting him at a few Bucs games he covered for the Falcons down here in Tampa, so he was already “buds” with Winston, and more than happy to make it all happen). The night before, Winston treated Rob, the Dolphins photo crew, and me to a wonderful dinner near the stadium and we basically closed the place – staying up late talking football and photography, until they nearly threw us out. Winston was super psyched (to say the least), and the great guys on the Dolphins crew were nearly as excited to see someone so tickled about this opportunity. Just one of those great nights you don’t forget, but this was only the beginning. Winston couldn’t even make it from the parking lot to the stadium without stopping every 50 yards to get another picture of Hard Rock Stadium. He was all grins, and we kept busting his chops as sports guys are known to do when one of the guys can’t stop smiling from ear to ear. We get inside the stadium, and the Dolphin’s guys and Rob give us a tour of the newly renovated stadium (and it was pretty sweet). We’re getting a tour of one of the VIP clubs (which this early before the game, was practically empty) when up steps Dolphins Hall of Famer, Larry Little to welcome us (and yes, he was wearing his Hall of Fame jacket). Winston recognized him immediately, and the two stood there sharing stories for 20 solid minutes. Larry was so gracious and kind, and funny, and I think if we hadn’t dragged Winston away, we probably would have missed kick off. As we were finally walking away, Winston looks over at me, and says, “I can’t believe I just met Larry Little. I can’t believe it! He was so nice! I can’t believe what just happened!” He was on cloud nine. We turn around, and behind us, just a few feet away on the sidelines, sitting in a golf cart is the one and only Don Shula – the legendary Dolphin’s Coach — and yes, the coach of that miracle 1972 Dolphin’s team. Winston was speechless (for about two seconds) as they walked him over to meet “The Coach” and Winston and Don chatted for a few minutes about the old team, and today’s game, and then I got this photo of them together. This was truly a magic moment, and I was just thrilled to be there to see it. Winston meeting “The Coach” — Don Shula. When they parted, and Winston walked back over to me, he laughed and said, “I just met Don Shula.” Then he stood there with the biggest smile. I don’t think even for a second that Winston thought he might meet Shula in person, but he did, on the sidelines of a Dolphin’s game he was getting to shoot. It doesn’t get better than that! Actually, it does. While Winston is still reeling from meeting Shula, one of the guys comes up again and says, ‘Hey, want to meet Dan Marino? He’s right here.” Winston turns around, and there is Marino — Dolphin’s Hall of Famer QB and another of Winston’s heroes. That look on Winston’s face says it all. Before you knew it, it was game time. We covered the player intros (through the smoke and fire), and then it was kickoff, and we all went to our different positions on the field and started shooting. Because it was “that kind of day” for Winston, of course, the Dolphins won. Winston once again shot “lights out,” and he shared his Picks from the game over at his SmugMug page. I captured a few for you below so you can get a sense of what a talented shooter he truly was, and why teams were so happy to have him shooting for them on their sidelines. I knew Winston would want a few pics of him shooting on a day like this, so in between plays I’d grab a shot or two, and I wanted to share them with you here (below). After the game, as we’re packing up, and he can’t stop grinning from ear to ear, I asked him “So, how was your day.” He just laughed, “It was OK.” As we’re walking out to the car, he thanked me again and again for helping him get this opportunity, and he said, without a doubt, it was absolutely one of the best days of his life. I know a lot of people say something like that, but in this case, I believed him. However, I was just blessed to be there and to have seen it happen, but it was Rob Foldy and the gracious crew of the Dolphins that truly brought Winston such a magical day. I will always miss Winston. He was just one hell of a guy. A friend and mentor — immensely talented and humble to a fault. You can ask anybody who knew him, inside Adobe or on the sidelines — he was a Hall of Famer in his own right. He was one of the greats. Scott is a Photographer, bestselling Author, Host of "The Grid" weekly photography show; Editor of Photoshop User magazine; Lightroom Guy; KelbyOne.com CEO; struggling guitarist. Loves Classic Rock and his arch-enemy is Cilantro. Devoted husband, dad to two super awesome kids, and pro-level babysitter to two crazy doggos. Previous PostIf You Hate Your Flash, I’ll Bet It’s Because…. Next PostAdobe Releases New Photoshop “Select Subject” Feature and It Kicks A@$! Scott, I’m so sorry for your loss. We have all lost an advocate for our work and passion. I love the “Dolphins day” that you and Rob arranged! He’s got quite a story to tell when he gets to heaven. RIP Winston, we’ll take it from here. Thank you, Deb. He touched a lot of people and did a lot of good. Thanks for writing this, Scott. I’m going to miss him a lot. He was a friend, a mentor, and a terrific leader. Lots of us inside Adobe are in mourning. Hi, Brian. You know, it was Winston that first introduced you and I. He was such of fan of what you’re doing with Adobe Spark. I’m so sorry for your loss. Wow, what a tremendous loss to the industry, and to lose a friend like that is doubly heartbreaking. The Dolphins shoot story was terrific, and you really captured what kind of man and photographer he was. Thank you for sharing your memories with us, Scott. RIP Winston. P.S. A tribute is in order at this year’s PSW. Best Wishes to his family and friends. I’ve been trying to find grid episodes to view as I can’t get them live due to personal scheduling. Is there a good link to watch past episodes – everything I’ve tried seems to re-direct to a portal which is only available to KelbyOne members ? Thanks Scott for sharing such a wonderful story. The world of photography has lost a kind and gentle giant. R.I.P Winston! You had me at the Larry Little story. I’m crying! What he has done to make our photographic lives so much more enjoyable in the digital age…we will be forever in his debt. We will. Thank you, Greg. Heaven just got a whole lot brighter today. Even in the midst of battling the evil “C” he continued to inspire greatness from all who were blessed enough to be touched by his Spirit. Thank you for sharing this perfect day. It adds dimension to a man I barely knew but so deeply cared for. A man, that through the shared experience of cancer, taught me how to sharpen my focus using the most powerful lense in my bag —-prayer. Beyond the business of photography, there are the people in photography. As we get further along our path, we realize that life is all about the journey, not the destination; all about time spent with people we care about, not about the places we visit that have no awareness or care for our presence. You are blessed, Scott Kelby, by the moments you have shared with this true friend of yours; blessed again that you can share this moment in words that make it come alive; jumping off the page so we relive those wonderful moments along side you. Great photograpers are great storytellers. Then there is a cut above: great photographers who tell stories with words that breathe life into their story-telling images. Thank you for your very kind words, Bob. That means a lot. So sorry to hear about your dear friend Winston. It’s always tough when someone you’re close to passes on. Just know that my prayers are with you and his family! Thank you, Dennis. Those prayers are so appreciated. I’m sorry you lost a friend, Scott. Thanks for sharing such a warm tribute. Great story. Huge loss as well. It was too early to miss him. Thank him for all his efforts and thank Scott for his nice words and stories. RIP. Man, Scott, what a great tribute. You’re right about Winston making you feel like he’s been your lifelong friend and being truly sincere about it. My interactions with him were fleeting, but they were always engaging. I remember asking about his Falcons work and he immediately shared some of his latest shots with me and gave me some sports shooting advice. What a great guy and a great loss. But despite his being gone, it’s inspiring to see how many people he shined a light on during his life. Such sad news to hear hear about Winston’s passing. The creative community lost a huge talent and a gentleman in every sense of the word. Thank you, Scott, for your heartfelt tribute to someone who made a difference and touched thousands of people. God bless. Beautiful description of an amazing day for an absolutely wonderful human being. Thanks for sharing this Scott. I remember Winston telling me about ‘this day’ over a beer in Seattle. Unforgettable. He will be missed. Such a thoughtful and heartfelt tribute Scott. I wish I could have known Winston. Reading about his life and career, and about how much his friendship meant to you, are the next best thing. Really touching and lovely tribute Scott, I got to say hello to him once at Photoshop World. You could see how much he meant to you on the Grid tonight, as hard as it was it was a nice touch to dedicate the show to him. One of the great guys that many could learn from. Wonderful story about the Dolphins. Sometimes it is so hard to accept that we are just in transit in this planet. I hope he didn’t have to suffer much and that now he will Rest In Peace. Please forward to his dears, including yourself, my deepest condolences. 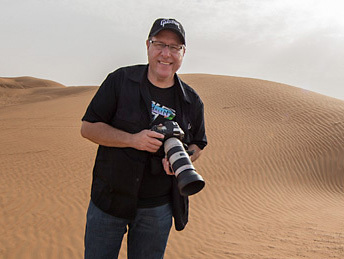 Scott is a photographer, award-winning author and the original "Photoshop Guy" as well as the CEO of KelbyOne, an online educational community for Photographers, Photoshop and Lightroom users.